Steel suspension lowering bracket plates lowers the rear end of the Honda CBR 1000RR by 30 mm. Lowering kit for Honda CBR 1000RR Fireblade for year 2008-2011, 2012-2016 and 2017-2018 SC59 models. Supplied with model specific installation instructions. corrosion resistance. Made in United Kingdom (England). 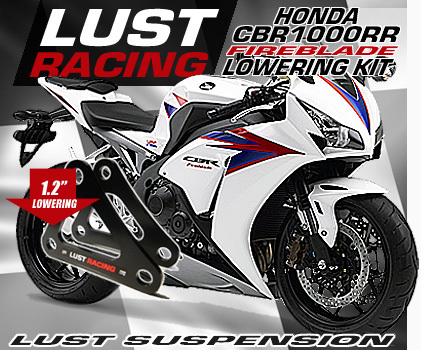 WHY buy a Lust Racing CBR1000RR lowering kit? Fitting a lowering kit will increase high speed stability and improve rear wheel traction. If desired the front forks can be lowered after fitting a rear suspension lowering kit. How to lower the front forks correctly is described in our bike specific lowering kit installation instructions. Lowering brackets clearly marked with dot and arrow makings. Precision made using high tech manufacturing methods. Strong steel suspension lowering brackets that will last the lifetime of your bike. Lust Racing lowering kits are powder coated black for corrosion resistance. Top quality british engineered and manufactured product. Accuracy, quality and finish second to none. Specified lowerings and specified accurately. Fast dispatch all items in stock! Quality item arrived quickly, my bike feels and look brill now!